There is no finish line. Or is there? This past weekend I was in San Francisco for the NIKE Women’s Marathon, benefiting the Leukemia and Lymphoma Society. This was the 8th year of the event and was clearly the best race weekend, ever. The weather was fantastic. The pre-race activities were done well, and race day was as close to perfect as I can imagine. My congratulations to everyone who was involved in the production of the event. I’m there as National Spokesperson for the Society’s Team in Training program. I’m lucky enough to be able to speak to 6,000 people at the Inspiration Dinner. It’s amazing to look out at that crowd and know that everyone there has the same goal; curing blood cancers. It’s even more amazing to know that the work that this year’s participants, who raised nearly 13 million dollars, and the work of the hundreds of thousands of runners and walkers that came before them, is not only changing lives, but saving lives. They are, we are, making a difference. One of the real treats for me every year is getting to spend a little time with Joan Benoit Samuelson. In case you’re from another planet, I’ll just tell you that “Joanie” was the gold medalist in the first Women’s Olympic Marathon in 1984. 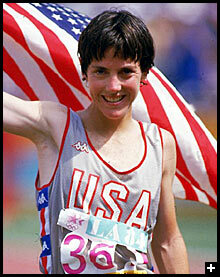 She was also the American Women’s Marathon record holder for nearly 20 years. And, oh by the way, she is the only woman to EVER run a sub-2:50 marathon in each of 5 decades. Dig THAT! Joan talks about how, for her, there is no finish line, and she encourages others to think the same way. Each finish line, according to Joan, is an opportunity to set a new goal, to raise your personal bar, and to go in search of a new achievement. In the years that I was a professional musician that was certainly true for me. Every performance was just a mile post, a short respite. The morning after even the most satisfying performance I was back in the practice room trying to improve. But, I’m not sure that it’s true for everyone that there is no finish line. 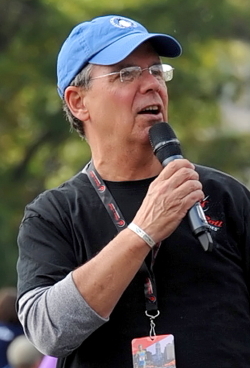 In my work as the Finish Line announcer for the Competitor Group’s Rock ‘n’ Roll Marathon series I have seen over a million people cross finish lines. I’ve seen winners cross in World Record time, I’ve seen the final finisher struggle to walk the final few yards, and everything in between. And I think, at least for some of them, there is a finish line. There is a line which, when crossed, brings some part of their lives to a close. There certainly was for me. Crossing my first finish line changed me from someone who thought about doing things to someone who DID things. I wasn’t just that guy who wanted to run a 5K or marathon, I was the guy who HAD. It wasn’t even that important that everyone else knew that I had. I mattered that I knew. So, while I understand Joan’s message, I think that for many of us there is a finish line. And not just one. Some of us have to keep crossing those finish lines to remind us that we can. You are an inspiration! We love you! Thanks for the inspiration. I signed up for a half marathon on a whim, while overweight and not exercising. I did no training, but decided to still do it. Guess what, I did it. Walked the whole dang thing, but I finished it. I now I get it. I actually am someone who DID it, not just talked about it. Even today I did my second official race – a 5K. Guess who came in last? ME. But I kept thinking about your famous quote about starting, and was glad to be out there. I am not waiting anymore, I’m doing! Thanks for being someone who “gets it”. The finish line of that half marathon was correctly placed at the same spot as the STARTING line! Well said John! As a child I had determined early on that I was “not athletic”. My brothers were fast, strong etc. I was smart, bookish or musically talented. I didn’t run- avoided sweat at all costs. The finish line of my first half marathon in 2009 marked the end of that mindset. 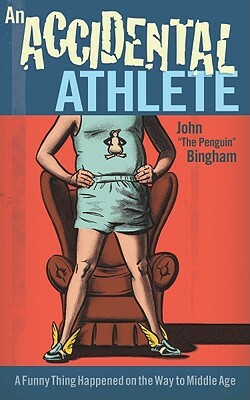 I’m still not fast, but I am an athlete. I was at the Inspiration Dinner on Saturday and loved hearing you speak, John! And, having now completed my first full marathon with TNT, you words ring very true- there is no finish line until cancer is cured and for me, I’ll certainly keep raising money and running to try to change that. Thank you for your and Joan’s) words of wisdom!